I'm excited to let you know about the next event we're doing – a post-election livestream with former Speaker of the Knesset, and former chairman of the Jewish Agency for Israel and the World Zionist Organization, Avraham 'Avrum' Burg. 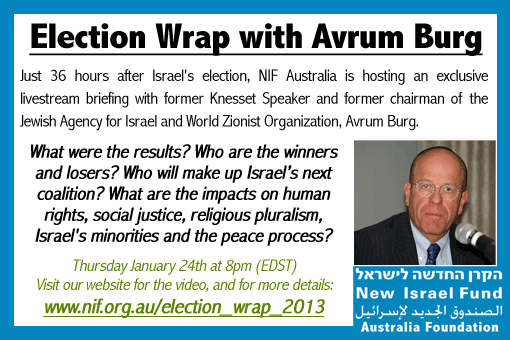 Just 36 hours after the election, Avrum will leverage his experience of 25 years in politics, civl society and Israel-Diaspora relations to give us his insight into the election campaign, the results, and the impact it will have on NIF's grantees and issue areas, including social justice, the inclusion of minorities, and the peace process. There are two ways to join us. The easiest is simply to log on to our website at 8:00 PM (Eastern time) on Thursday January 24th and watch the livestream as it happens. You can ask your questions and add a comment next to the video, or using the Twitter hashtag, #NIFAUelection. Bookmark http://www.nif.org.au/election_wrap_2013 today, because that's where we'll put the livestream once it begins. We also have limited spaces at venues in both Melbourne and Sydney to join other NIF supporters, come together and discuss the election results. But don't worry if you can't make it – you'll get exactly the same experience and opportunity to ask questions from home. We hope that you'll join us as we try this new method of bringing NIF Australia supporters together to engage with critical issues affecting Israel and Australian Jewry.